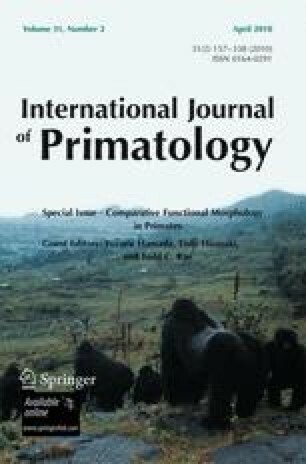 Understanding how primates move is particularly challenging because many of the experimentation techniques that would normally be available are unsuitable for ethical and conservation reasons. We therefore need to develop techniques that can maximize the data available from minimally intrusive experimentation. One approach for achieving this is to use evolutionary robotic techniques to build a musculoskeletal simulation and generate movement patterns that optimize some global parameter such as economy or performance, or to match existing kinematic data. If the simulation has a sufficiently high biofidelity and can match experimentally measured performance criteria then we can use it to predict aspects of locomotor mechanics that would otherwise be impossible to measure. This approach is particularly valuable when studying fossil primates because it can be based entirely on morphology and can generate movements spontaneously. A major question in human evolution is the origin of bipedal running and the role of elastic energy storage. By using an evolutionary robotics model of humanoid running we can show that elastic storage is required for efficient, high-performance running. Elasticity allows both energy recovery to minimize total energy cost and also power amplification to allow high performance. The most important elastic energy store on the human hind limb is the Achilles tendon: a feature that is at best weakly expressed among the African great apes. By running simulations both with and without this structure we can demonstrate its importance, and we suggest that identification of the presence or otherwise of this tendon—perhaps by calcaneal morphology or Sharpey’s fibers—is essential for identifying when and where in the fossil record human style running originated. We thank Cliff Addison and the NW-GRID for providing the necessary high-performance computing power for this project and NERC and the Leverhulme Trust for providing funding. We also thank Todd Rae, Eishi Hirasaki, and Yuzuru Hamada for organizing the meeting and this special issue.